Any movie that has a colon as part of its title suggests that this will be the start of a franchise: Prince of Persia: The Sands of Time, Percy Jackson & The Olympians: The Lightning Thief, Terminator: Salvation. Now we have Dylan Dog: Dead of Night. Based on a comic book, Dylan Dog somewhere in it has the potential, not perhaps for a franchise, but for a good time or an effectively scary movie or a comedic romp. Dylan Dog, however, is just a disaster of a film. 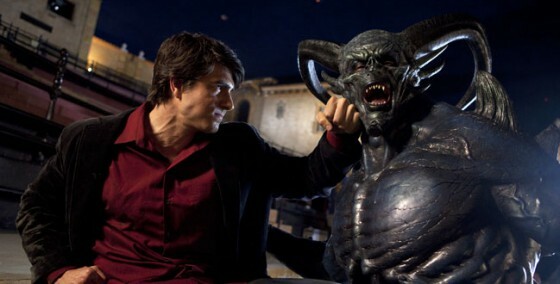 Dylan Dog (Brandon Routh) is a former investigator for the paranormal and peacekeeper between the supernatural factions living in New Orleans: mostly between the vampires and werewolves, since the zombies rarely bother anyone. However, an incident specified later has driven him out of the business, and he's reduced to following cheating husbands around to pay the bills. His associate Marcus (Sam Worthington) wants to be a full partner, but Dylan continuously turns him down. There's a murder in New Orleans: a collector has been killed, and the dead man's daughter Elizabeth (Anita Briem) suspects there is a supernatural connection. She contacts Dylan, who finds that a werewolf is involved, but he himself doesn't want to get involved in this business. However, his hand is forced when this same werewolf bumps off Marcus. Now, Dylan plunges into the investigation, where we learn that someone is after an object called The Heart of Belial: a cross that contains the blood of a powerful demon, at least I think it's a demon, who will destroy all the living and be under the control of whoever has the cross. Now, who is after the Heart? Is it the vampire Vargas (Taye Diggs)? Is it the werewolf clan, headed by Gabriel (Peter Stormare)? To help in his investigation, we have none other than Marcus! That's right: in the world of Dylan Dog, not even the wacky sidekick/comic relief stays dead for long. Marcus is a most unwilling zombie: constantly refusing to admit he's dead despite not having an arm and being unable to eat anything other than worms, which he constantly refuses to do. Eventually, we find that Dylan and Vargas have a past together, but while the obvious candidate for all the killings is before us, the actual mastermind has manipulated the situation to attempt to bring the world under her control. Sadly, Dylan Dog has so many things going wrong for it that despite the cult following it has, I can't imagine its hard-core fans would care for this film adaptation. First, there really is no focus as to what exactly Dylan Dog is. Is it suppose to be a comedy? Marcus' whole shtick appears to guide it in that direction: one of the few bright spots involves his character attending a C.O.L.D or Coalition Of the Living Dead support group meeting. Is is suppose to be an action film? The 'climatic' battle between Dylan and the demon suggest that it is. Is it suppose to be a horror film? Certainly having werewolves and vampires suggest it is. There in a nutshell is just one aspect of what is wrong with Dylan Dog: it always suggests that it's going to be something, but it never goes all the way in being one thing or another. It can be a revenge drama, a comedy, an action film, a horror film, but it can't decide what it is, so it ends up being none of them. When Marcus rises from the dead all of a sudden, it becomes a horror film. When he gets a black arm to replace his white one, it is a comedy. When he uses his arm to fight the Demon King, it's, an action comedy? Second, Dylan Dog has remarkably uninteresting characters and situations within a film that at least has elements to be a whole host of things. Perhaps Routh was directed badly, or perhaps he just can't act, but as Dylan Dog he has this curiously lacquered expression throughout the film. Whether he's fighting a demon, mourning a friend, getting information at a body shop where they literally have bodies (get it, 'body shop'), or having a love scene with his client, Routh has the same expression: one that reads one of two ways. It can either read, "I've got to get through this because after I got blamed for Superman Returns' failure I need to show I can carry a franchise", or "I need to find another agent altogether". When your lead is basically frozen into an expression that is a cross between disinterest and bored, you will never get off the ground (no pun intended). As if to counter Routh's frozen face, his Superman Returns costar Huntington appears to be overcompensating for Routh's blandness by going overboard in the attempt to be the comic relief. At times, Marcus comes off as either incredibly stupid or downright insane in his inability to accept the situation he's in. Despite coming back to life in a morgue, despite seeing his body slowly disintegrate, despite having a black arm on his white body, he doesn't seem to get the fact that he's a zombie. We might be able to forgive having the vaguest explanation as to how Marcus came back to life, but we can't forgive Huntington constantly freaking out at nearly everything he encounters postmortem. What makes this more sad is that I think Huntington is a genuinely talented actor who deserves so much better. Diggs lives up to the 'vamp' aspect of his role, attempting to give menace to his vampire but only showing his character to be a little camp. Briem did well as the mortal in danger, until we got to the obligatory love scene which while not unexpected, did still manage to come out of nowhere, and then cemented her failure when we had the 'shocking twist' that was anything but. Here's the thing about shocking twists: they have to be built on a logic. Dylan Dog appears to throw in this 'shocking twist' out of nowhere, and it's a cheat to the audience to have the conclusion the film has because we're never given any clues or hints that it makes any sense at all. It appears to be extremely random, which makes it illogical and unfair. However, there's even more wrong with Dylan Dog, amazing as it sounds. The make-up is among the worst seen in recent years; the werewolves on MTV's Teen Wolf look more realistic than the ones in Dylan Dog. There's no excuse for the first werewolf we see transformed to look like he was wearing a mask bought at a store. Kevin Munroe couldn't direct his actors to show anything other than hysteria or dullness; he also couldn't pull together an interesting story or give us any indication of what was going on. Of all of Dylan Dog's sins against cinema besides those already mentioned, it actually has two major ones. The first is its screenplay (by Thomas Dean Donnelly and Joshua Oppenheimer, adapting Tiziano Sclavi's cult comic series). There is this pathological and illogical reliance on voice-over in Dylan Dog that is unnecessary, maddening, and downright stupid. What truly makes the voice-overs in Dylan Dog insidious is that it is idiotically repetitive. For example, early in Dylan Dog we see and are told in Dylan's voice-over that the vampires or "Truebloods" use their own blood as a drug to sell to the mortals to get a sense of euphoria and strength. However, when we get to Al's Body Shop we see and hear the characters give us the exact same information! Seriously, why repeat what we've already been told? How could any writer, let alone a pair of writers, not think that it made any sense to give us the same information both in voice-over and in dialogue? If that weren't bad enough, making the voice-over serve as foreshadowing only compounds how disastrously wrong Dylan Dog goes. Again and again, we hear Dylan tell us in voice-over how 'if I'd only known...', or 'I should have thought...', and this is just lazy writing. In fact, the pathetic and incessant use of voice-over in Dylan Dog has inspired me to establish a new Golden Rule of Filmmaking: Keep Voice-overs (Especially Voice-overs That Describe Emotional States) to An Absolute Bare Minimum. In so many ways, Dylan Dog: Dead of Night was a bore. The climatic battle between Dylan and the Demon raised by the Heart of Bilal had no sense of urgency or danger in it. The acting was either hyper or dull, a reflection of its chaotic inconsistency. Its story wasn't interesting, and while some comedy moments were amusing (the support group for zombies was clever), it wasn't enough to make it worth watching. Side note: I would have preferred a movie about C.O.L.D. and the zombie support group than the supernatural goings-on. Nothing sinks Dylan Dog: Dead of Night, than the fact it had the conceit to think it would be a franchise. As I've stated, the title itself announces that there was a hope that there would be a call for more Dylan Dog adventures. However, the ending...dear God, the ending. I tolerated a lot in Dylan Dog, but that was one too much, and it pushed it down beyond salvation. Dylan Dog: Dead of Night will do more damage to Brandon Routh than Superman Returns' failure, and any hopes for a Dylan Dog franchise is as dead as the C.O.L.D members.